The castle, an ancient seat of the Comerford clan, is a five storey, 16th century towerhouse. Located just 8 km south of the medieval city of Kilkenny, which offers a wealth of wonderful pubs. The castle, an ancient seat of the Comerford clan, is a five storey, 16th century towerhouse. Located just 8 km south of the medieval city of Kilkenny, which offers a wealth of wonderful pubs, activities and local sites. The castle has been restored to its former authentic glory using the same techniques and materials as the original 16th century builders. The rooms are rich in character and offer a truely unique atomsphere. Modern comforts have been incorporated without detracting from the simple grandeur of this ancient dewlling. This beautiful example of a medieval towerhouse, built for security and status, is still a feature of the Irish landscape. It is a five storey keep rising to a height of 65 feet. A surprising feature of the Castle is the light. Though narrow, the windows have deep angled sills which deflect the light very efficiently. The Castle is charming self-catering holiday home where guests will have an unforgettable stay. Full cleaning and catering can be arranged. The ground floor was originally used to store goods, but also people and livestock in times of danger. Now used as a fully fitted kitchen. You can therefore cook a medieval feast without the medieval cooking appliances! Going through the back door, you enter a secluded south facing patio area with a large fireplace for a BBQ or open fires. Garden furniture is supplied. The second floor now consists of an immense bedroom with a four poster bed and niches in the walls for sleeping. It will be the ideal family room or bridal suite. On this floor there is also a smaller bedroom and a very elegant bathroom, with a victorian bath (the biggest we've ever seen!) along with all the modern conveniences one expects. On the third floor you enter a very substantial room with deep niches in the walls, once used as beds. Now this floor is a huge double height dining room, with an enormous chandelier hanging down in the centre. The room has a medieval stone fireplace for big blazing fires, a long dining table with church pews for large dinners, seating up to 12 people. Off this room there is a bedroom with two comfortable beds and windows with views of the grounds.This floor also has a smaller kitchen in which one can prepare light meals. This kitchen is fitted with a sink, oven grill, microwave and of course crockery, cutlery, glasses, etc. You will also find a very elegant shower room. The fourth floor, with it's vaulted ceiling, is now a bedroom. Once, this room was the family chapel. This floor also has a shower room. All beds in the castle have orthopedia matresses, electric blankets, duvets with covers and feathered cushions for a snug and deep sleep. They also all have victorian cast iron radiators installed. The fifth and top floor was once the state apartment, and is now a magnificent baronial drawing room, with another huge stone fireplace. The room has a vaulted ceiling left exposed to maintain the traditional feel of the room, and another giant chandelier hangs from the ceiling. This room has several lounge seats, a beautifully hand crafted swing in one of the alcoves, and a table with chairs for games. Heavy curtains hang down to make the room cosy in the evening. There is also a music installation and games available. There are four windows, each one of them facing the cardinal points. The views are magnificent in all directions. Off this room is a secret room with a deep floorshaft, used as a priests' hole or to keep prisoners. A smaller flight of stairs leads up to the ramparts, where you can gaze as far as Mount Leinster or Slievenamon on a fine day. Nestled in the hub of Ireland's Ancient East, Kilkenny is the Medieval Capital of Ireland, the castle is the perfect base from which to immerse yourself in its historic slipways, music, culture and arts. 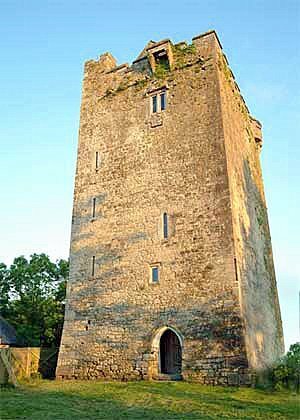 Towerhouse Castle is located 8 km from Kilkenny, 64 km from Waterford, and 120 km from Limerick, Cork and Dublin. - John Cleeres, Kilkenny - This cosy and traditional Irish pub offers a great atmosphere and friendly service also a variety of Irish traditional music every Monday. It also has a 100 seater venue at the rear, where good quality Irish music is performed every weekend. Highly recommended. - Andrew Ryan, Kilkenny - Good tunes, good beer and good company. This is the house of good music in Kilkenny for those who like traditional, blues and country rock. There is a fabulous beer garden and a comfortable smoking area. - Carrolls, Kilkenny - This is a really traditional Irish pub, and the cosy, warm and friendly atmosphere is welcoming. The enthusiastic staff give guests the best of service. Traditional Irish music sessions are held here regularly and the craic is great. The best of pub grub is offered, and during the summer there is a spectacular beer garden open which also features a barbeque. - The local pub in Cuffsgrange: Just a 10 minute walk from castle, proprietors Liam and Marianne Murphy host the 'sitting room' of the locals. The craic is mighty. - The Left Bank, Kilkenny - A funky venue that was remodelled in 2008 from a Bank of England Headquarters and is arguably one of Kilkenny's most popular pubs. - The Hole in the Wall, Kilkenny - A new music venue in the heart of the city, it is housed in the oldest surviving townhouse in Ireland- the 1852 Archer Inner House, 17 High St.
- Kytlers Inn, Kilkenny - Winners of the tourism bar of the year in 2014, it combines a rich heritage with 21st century amenities and service. Since it was first established by the notorious Dame Alice de Kyteler in the 13th century, the inn has welcomed visitors and provided them with good food and beverages. There are eight golf courses in Kilkenny City and county, offering a variety of challenges for both the experienced and novice player. There are 18 hole and 9 hole parkland courses, par three golf facilities, driving ranges, pitch and putt courses and even a crazy golf course to satisfy every skill level. Kilkenny provides ample locations and opportunities for all those who enjoy horse riding at whatever level and activity they require. Game angling is the best on the rivers Nore and Suir and their tributaries with some trout and salmon on the river Barrow. Coarse anglers will especially enjoy the River Barrow where there is excellent bream fishing from late April to October. Rudd is in plentiful supply in summer and pike fishing is more rewarding in the cooler months. Cross Country quad biking on a scenic livestock farm is available for those age 8 years and upward. Half an hour drive from Kilkenny. Up to twelve people at any one time. Clay pigeon shooting is available on request. Set in extensive parklands, this 13th century Kilkenny castle was once the home of the Butlers, Earls and Dukes of Ormonde. The castle has been magnificently restored and guided tours are available all year round. Jerpoint Abbey:This outstanding Cisterian Abbey was founded in the 12th century. The church, with it's Irish Romanesque details, dates from this period, though the tower, east window and the beautifully sculptured cloister arcade date from around 1400. Dunmore Cave:This is one of Ireland's most interesting limestone caves. First mentioned in the 9th century Irish Triads, it was reported to be the site of a viking massacre in 928 AD. Coins found in the cave date from 897 to 926. The monastery of Kells dates from 1193 AD. The seven towers are in various stages of preservation, but they must have been top-level in their standard of comfort for their inhabitants. It is an ideal place to bring children for a day outing. Apart from what they would learn in history, they would certainly enjoy the day playing at knights in armour up and down the steps and exploring the castles.